Each restoration takes approximately 1 months time of dedicated work. 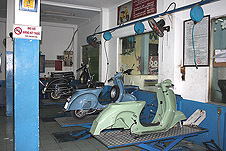 As classic Vespa lovers ourselves we put heart and soul into each individual restoration. The end result is an immaculately restored piece of history that is mechanically sound and reliable. 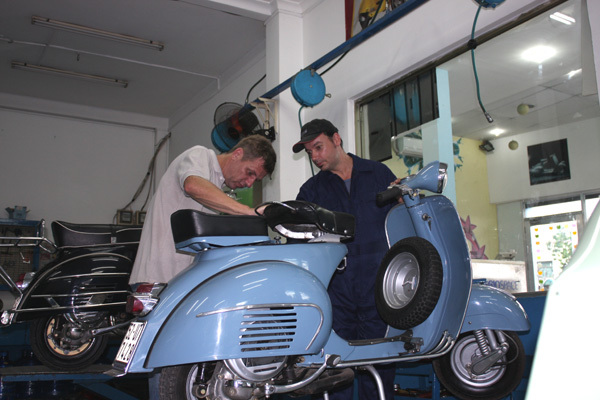 Our Vespas run as factory new, (or even better as many of the mechanical components are made from more modern and stronger alloys). 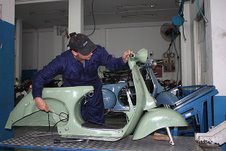 Everything is brought back to new condition giving our Vespas another lifetime of reliable driving including: New 150cc reconditioned Piaggio Italian Engine, New 4 speed Transmission, New internal wiring, seals and trimmings, New brakes, New seating upholstery and all of the other components as listed below. First and most importantly is to find Vespas with solid chassis and frames providing a solid foundation for us to work with. Every week our scout truck brings back salvaged Vespas to our workshop for inspection. We discard all frames that are bent or have been in prior accidents, have rust or filler. We only restore and work with the very best frames. 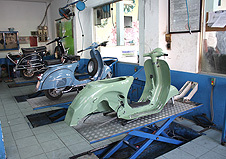 The Vespas are then completely stripped down leaving only the free standing frames. The frames are then sandblasted down to a smooth bare metal finish using a specific media cutting agent for heavier gauge vintage metal. After re-alignment, a high quality 2 part epoxy rust inhibiting primer is then coated and bonded to the bare metal in preparation for the paint. Epoxy primer is used as a direct to metal primer (DTM) because of its excellent corrosion resistant properties. Baked on painting process hardened and cured in a specially designed oven. (paint cured in this manner has been proven to last longer and provide a more durable resistance to the elements) Industrial strength Automotive ICI paint provides corrosion resistance and insulation against rust. (people residing near the sea need not worry). Finished with several high gloss coats. The newly painted scooter frame is then reassembled with all the new components as listed below.